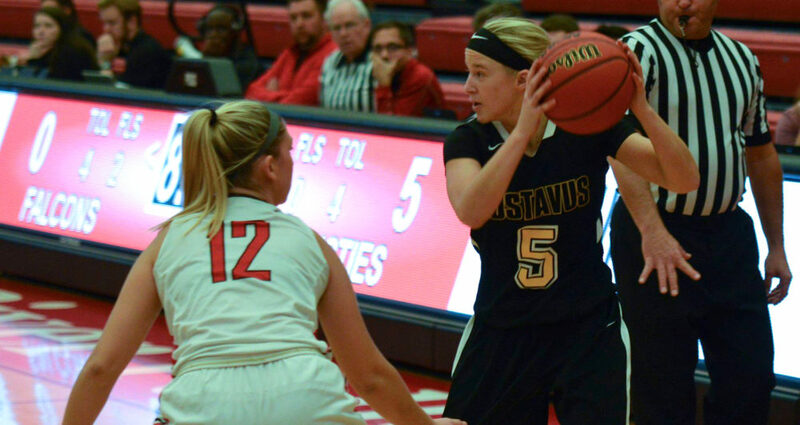 RIVER FALLS, Wis. – The Gustavus women’s basketball team opened its season with a tough loss to UW-River Falls on Friday by a score of 73-67. The Gusties got off to a quick start jumping out to an early 24-13 lead at the end of the first quarter, but the Falcons battled back and outscored the Gusties 19-9 in the second quarter to trail by just one at the half. Justine Lee (Sr., Dawson, Minn.) played well in the first half tallying 10 points on 3-6 shooting, while Kendall Thompson (Sr., Eden Prairie, Minn.) had seven points to go along with three rebounds. The two teams played nearly even in the third quarter but the Falcons took over in the fourth, outscoring the Gusties 23-14 to take home the victory. Field goal percentage proved to be the difference in the contest, with the Falcons shooting 49 percent, compared to the Gusties 34 percent. In the contest, Paige Richert (So., Comfrey, Minn.) led all scorers with 20 points to go along with six rebounds. Brooke Lemke (Sr., Delano, Minn.) also played well notching 15 points and recording three steals. The Gusties will next be in action on Friday, Nov. 16th when they host the University of Minnesota-Morris as part of the Gustie Classic for a 7:30 contest.